The carrots look, feel and taste wonderful this week. Carrots are in the top 5 of my favorite vegetables, and they really are a great food for your eye sight! I have never heard of a carrot cookie. I love carrot cake and muffins so what the heck, lets give it a try. I was told once that if you take 1 part fat, double that with a sweetener and double that with a binder you’ll have a cookie. Simplified – if you bind fat with sugar you will probably like it. So I tried it and it worked, but it was a bit sweet for me. I find matching the same amount of sweetener as fat works out better for my buds. ½ Cup Maple Syrup or other sweetener – You can add more if you like a sweeter cookies. You can mix the binders up a bit if you like. I usually go a little heavier on the oatmeal side. I have even blended up some breakfast cereal when I needed more binder. It worked great!!! That’s the base so now lets give it some personality. Mix all the dry ingredients in one large bowl. Do the same for the wet ingredients. 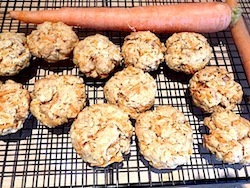 Mix the carrots into the dry flour mixture. 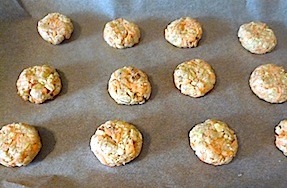 Then add the wet ingredients to the flour/carrot mixture. I add the nuts in at the end so I can see how much I want to use. 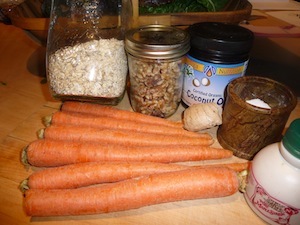 Check out the origin of this recipe on AC member Marissa Steven’s food & recipe blog! Thanks Marissa for sharing this with us! Shredding the parsnips and carrots speeds cooking and makes this a great weeknight soup – a food processor’s shredding disc does quick work of this. I like to scrub the parsnips and carrots but leave the skin intact – you can peel them if you prefer. Also, you can use 1/2 cup heavy cream in place of the cashew cream. Drain the cashews from their soaking water and add to the jar of a blender. 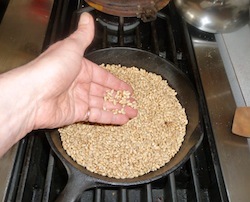 Add water to cover cashews by about 1″ and blend until smooth. Heat the parsnips, carrots, broth, and ginger in a soup pot over medium heat until boiling. Reduce heat and simmer, partially covered, for about 25 minutes. Remove from heat. 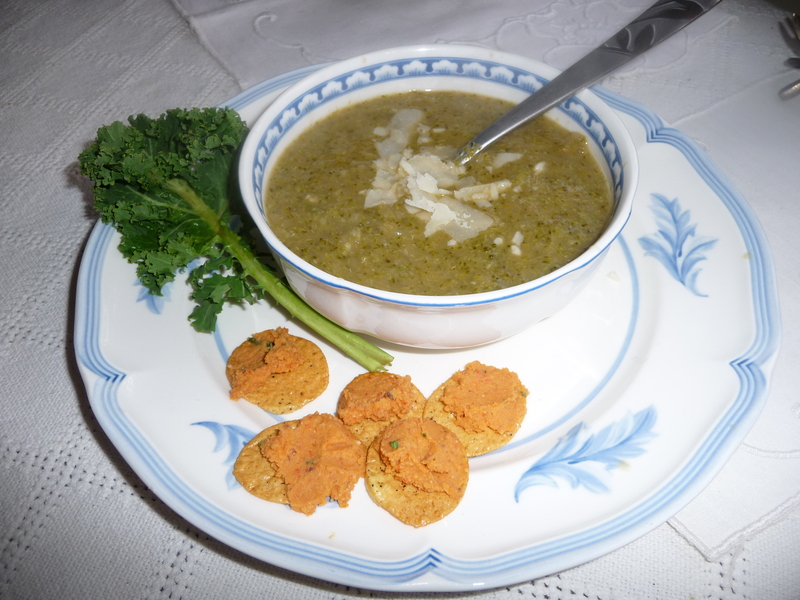 Season the pureed soup to taste with salt and ground white pepper. Add the lemon juice and cashew cream and bring to a simmer again over medium heat. Garnish with chives if you like and serve. Another week of fresh produce. 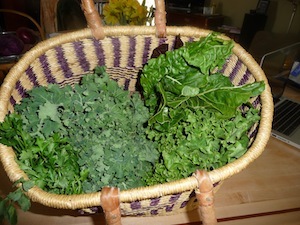 As I look at my produce share I see GREENS. Lots’ of them so I want to use those. Last week I did a “single” vegetable dish so this week I wanted to do a mixed vegetable dish. 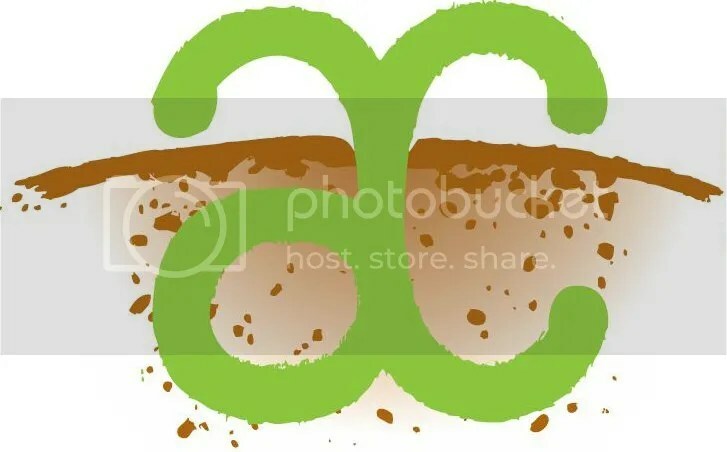 ¼ C Almonds or a big handful or a nut that you have on hand. ⅓ C oil (I used toasted sesame oil) any oil would work because you are not heating it. 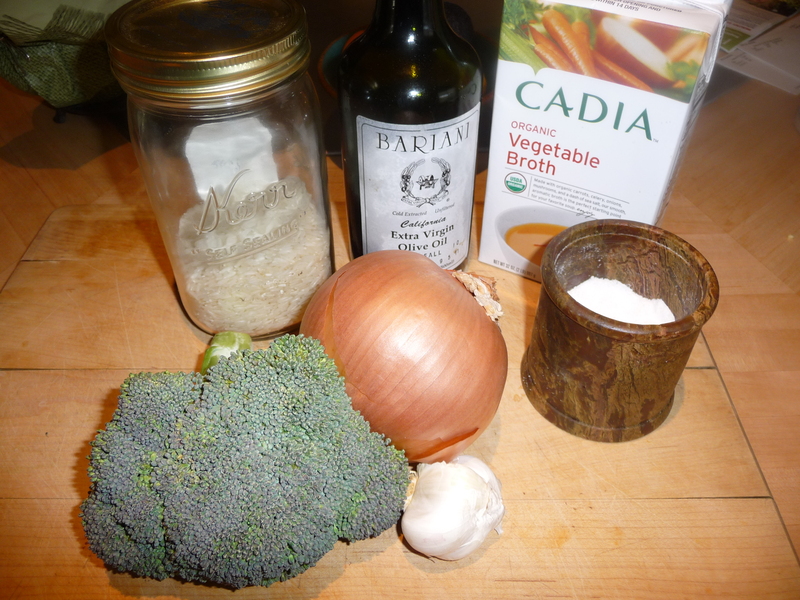 a stock to cook grains in). Look around…I had a red onion. Red pepper or any raw colorful crisp veg could work. 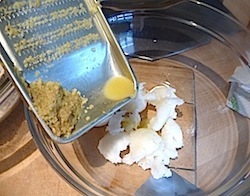 In a food processor chop garlic, almonds and a pinch of salt. Pulse-pulse. 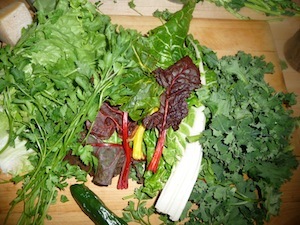 Then add the greens. Pulse-pulse. Scrape the sides down. Add the lime juice or a vinegar and oil. Pulse -pulse. Salt and Pepper. Pulse- pulse. As I added things I kept tasting and smelling. I kept getting overwhelmed by the thought of a green smoothie and that is not what I was trying to make so I decided it needed something. An interesting thing about flavors is that any of the other four can fix the overpowering one. The overpowering taste was bitter. The five tastes are: Salty – Sour – Pungent – Sweet – and Bitter. I already used salty (sea salt) and sour (lime) and pungent (garlic) and I don’t want sweet so I looked around in my fridge and pulled out horseradish. Smelled it. Yes. Tasted it with a little of the pesto. Yes. And added a spoonful and tasted it. Added another. Yes. 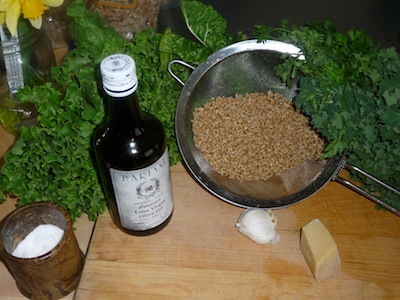 Mixed the pesto with the cooked barley. Top with a little red onion, chopped parsley and a little parmesan cheese. 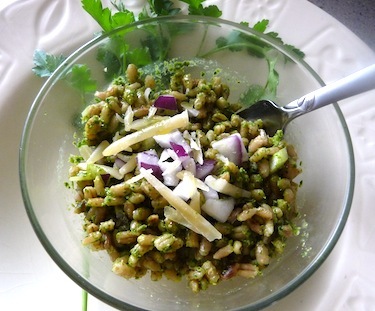 Mixed Green Pesto leftovers? Add some to a breakfast burrito made with farm fresh, pasture eggs from Dansky’s Dragonfly Ranch, Sand Lily Goat Farm or DD Ranch and some Cada Dia cheddar cheese. Hi, My name is Lisa Ehlers and I donʼt usually write recipes, I write stories. I look at the produce at hand and make a few decisions like do I want a mixed vegetable dish or a single vegetable dish. Do the vegetable look like they would go together well or stand better on their own. My choice was to focus on Broccoli. It was a very windy Thursday and I needed to write a recipe. On a windy day I like creamy soups. the stock and chop it up and add it too. 2 cloves garlic or enough for you…be brave! Stock Vegetable or Chicken or home made. Heat a sauce pan add the olive oil and immediately add the onions. Coat the onions in oil and let it caramelize on low heat for 3 + minutes or until you see the darkening color. Donʼt burn them. 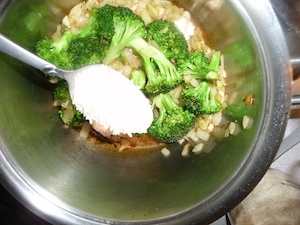 Then add the broccoli and coat it in the oil too. I call this sealing the vegetable and itʼs important in the flavors your can hold in a soup. Add the rest of the ingredients, including the uncooked rice, and coat them too. Pour in your stock until you have covered your vegetable by about an inch. Cook long enough to make sure your rice is done. 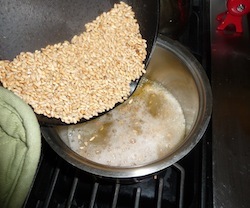 The rice will give the soup a creamy feel when blended. A little cauliflower would do the same. When the rice is done I turn off the heat and put my immersion blender in the pot and stir it around a bit. If you donʼt have an immersion blender you can use a Cuisinart or a blender. If you use a blender donʼt fill it above half way or the heat will pop the lid. I topped mine with a little freshly grated parmesan cheese and served it with roasted red pepper hummus on rice crackers. The colors work well together and the flavors were Yummy! From AC member Marissa Stevens. Thanks for sharing Marissa! Find out more recipes on Marissa’s food blog. If you choose to make this with kale instead, use Italian kale, also called lacinato or dino kale. If you can find Beaufor Extra Dijon mustard – I highly recommend it. Using a sharp knife, finely chop the Brussels sprouts and chard leaves. Add to the dressing in the bowl and toss to coat. 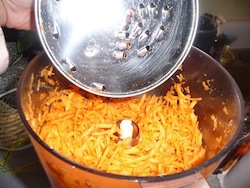 Add about half of the shredded pecorino and toss again. Top with remaining pecorino and almonds; serve. Another recipe recommended by AC member Laura Korb. Find more info. HERE. Combine the potatoes, parsnips, and vegetable bouillon base in a large pot with enough water to just cover the vegetables; season with the sea salt and black pepper. 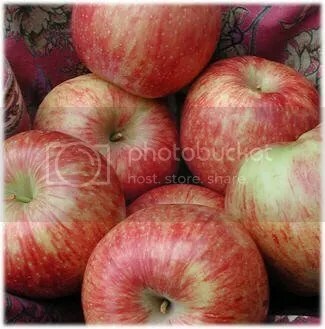 Bring the water to a boil over medium-high heat, and cook until the potatoes and parsnips are tender, 15 to 20 minutes. Pour the mixture into a blender, filling the pitcher no more than halfway. Hold the lid of the blender closed with a folded towel and carefully start the blender, using a few quick pulses to get the mixture moving before leaving it on to puree. Process in batches until all vegetables are pureed. Return blended vegetables to the pot, and place over medium heat. 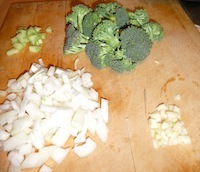 Stir the applesauce, balsamic vinegar, garlic paste, and truffle oil into the soup; bring to a simmer, and reduce heat. Simmer until the flavors combine, about 50 minutes. Add the cabbage to the soup, and cook until the cabbage softens, about 10 minutes. This recipe was recommended by AC member Laura Korb. I tried it last week and it was DELICIOUS!!! Find out more and see images HERE.